I grew up in the Swiss countryside and my parents used to grow our own vegetables. I hated it! I didn’t like vegetables and the ones home grown actually tasted so intense that it took me even longer to swallow them than the ones we bought in the store. Well, our garden didn’t make me like vegetables, but it did teach me the season of local vegetables and fruit. Even now living in the “big city” (like my parents would say), I try to buy seasonal and local (I place emphasis on “try”, because the winter is just too long to keep on eating 5 a day with apples, pears, carrots and cabbage alone, even by being very creative). 2. Heat oven to 200C/180C fan/gas 6. To make the topping, rub the flour, almonds, butter and sugar together with your fingers until you have a crumbly topping. 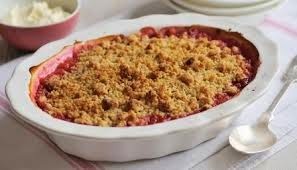 Scatter the topping over the rhubarb and bake for 30 mins or until the rhubarb is bubbling and the topping is golden brown. Serve piping hot. need to add), try oats instead of flour or other ground or chopped nuts, desiccated coconut or frangipane instead of almonds. You can also add spices like cinnamon or ground ginger and why not try pepper for a strawberry crumble. It’s an easy and quick dessert and counts towards your 5 fruits and vegetables a day (1 serving = 1 portion of fruit). Enjoy! – Potassium (15%). Potassium is good for lowering high blood pressure, for brain and nerve function. – Calcium (9%). Calcium is good for bones, teeth, heart. – B-vitamins, for nerve function. – Vitamin E (40%), an antioxidant. – Magnesium (17%), good for bones, muscles and nerve function. Feel better about yourself and your food!